1,1,1,2-Tetrafluoroethane (also known as norflurane (INN), R-134a, Freon 134a, Forane 134a, Genetron 134a, Florasol 134a, Suva 134a, or HFC-134a) is a hydrofluorocarbon (HFC) and haloalkane refrigerant with thermodynamic properties similar to R-12 (dichlorodifluoromethane) but with insignificant ozone depletion potential and a somewhat lower global warming potential (1,430, compared to R-12’s GWP of 10,900). It has the formula CH2FCF3 and a boiling point of −26.3 °C (−15.34 °F) at atmospheric pressure. R-134a cylinders are colored light blue. Attempts at phasing out its use as a refrigerant with substances that have lower global warming potential, such as HFO-1234yf, are underway. 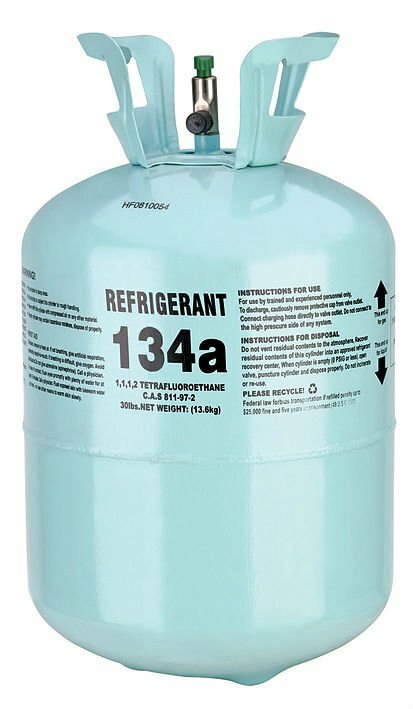 1,1,1,2-Tetrafluoroethane is a non-flammable gas used primarily as a “high-temperature” refrigerant for domestic refrigeration and automobile air conditioners. These devices began using 1,1,1,2-tetrafluoroethane in the early 1990s as a replacement for the more environmentally harmful R-12 and retrofit kits are available to convert units that were originally R-12-equipped. Other uses include plastic foam blowing, as a cleaning solvent, a propellant for the delivery of pharmaceuticals (e.g. bronchodilators), wine cork removers, gas dusters, such as Dust-Off, and in air driers for removing the moisture from compressed air. 1,1,1,2-Tetrafluoroethane has also been used to cool computers in some overclocking attempts. It is the refrigerant used in plumbing pipe freeze kits. It is also commonly used as a propellant for airsoft airguns. The gas is often mixed with a silicone-based lubricant. Tetrafluoroethane, when compressed as inside gas duster cans, is a clear liquid which boils when exposed to atmospheric pressure at room temperature (as seen here) and can be extracted from common “canned air” canisters by simply inverting them during use. 1,1,1,2-Tetrafluoroethane is also being considered as an organic solvent suitable for extraction of flavor and fragrance compounds, as a possible alternative to other organic solvents and supercritical carbon dioxide. It can also be used as a solvent in organic chemistry, both in liquid and supercritical fluid. It is used in the resistive plate chamber particle detectors in the Large Hadron Collider. It is also used for other types of particle detectors, e.g. some cryogenic particle detectors. It can be used as an alternative to sulfur hexafluoride in magnesium smelting as a shielding gas. 1,1,1,2-Tetrafluoroethane first appeared in the early 1990s as a replacement for dichlorodifluoromethane (R-12), which has ozone depleting properties. 1,1,1,2-Tetrafluoroethane has been atmospherically modeled for its impact on depleting ozone and as a contributor to global warming. Research suggests that over the past 10 years the concentration of 1,1,1,2-tetrafluoroethane has increased significantly in the Earth’s atmosphere, with a recent study revealing a doubling in atmospheric concentration between 2001 and 2004. It has insignificant ozone depletion potential (ozone layer), significant global warming potential (100-yr GWP = 1430) and negligible acidification potential (acid rain). Because of its high GWP, 1,1,1,2-tetrafluoroethane has been banned from use in the European Union, starting with cars in 2011 and phasing out completely by 2017. ^ “Table 2.14 (Errata). Lifetimes, radiative efficiencies and direct (except for CH4) GWPs relative to CO2”. Archived from the original on 6 July 2017. Retrieved 11 July 2017. ^ “Example image of a 30 lbs R134a bottle”. budgetheating.com. Retrieved 26 March 2018. ^ Corr, Stuart (2005). “1,1,1,2-Tetrafluoroethane (R-134a): A Selective Solvent for the Generation of Flavor and Fragrance Ingredients”. Natural Flavors and Fragrances. ACS Symposium Series. 908. p. 41. doi:10.1021/bk-2005-0908.ch003. ISBN 0-8412-3904-5. ^ Abbott, Andrew P.; Eltringham, Wayne; Hope, Eric G.; Nicola, Mazin (2005). “Solubility of unsaturated carboxylic acids in supercritical 1,1,1,2-tetrafluoroethane (HFC 134a) and a methodology for the separation of ternary mixtures”. Green Chemistry. 7 (4): 210. doi:10.1039/B412697A. ^ Abbott, Andrew P.; Eltringham, Wayne; Hope, Eric G.; Nicola, Mazin (2005). “Hydrogenation in supercritical 1,1,1,2 tetrafluoroethane (HFC 134a)”. Green Chemistry. 7 (10): 721. doi:10.1039/B507554H. ^ Norbeck, E.; Olson, J. E.; Moeller, A.; Onel, Y. (2006). “Rad Hard Active Media For Calorimeters” (PDF). AIP Conference Proceedings. 867: 84. Bibcode:2006AIPC..867…84N. doi:10.1063/1.2396941. Archived from the original (pdf) on 23 March 2012. ^ Franklin J (1993). “The Atmospheric Degradation and Impact of 1,1,1,2-Tetrafluorethane (Hydrofluorocarbon 134a)”. Chemosphere. 27 (8): 1565–1601. Bibcode:1993Chmsp..27.1565F. doi:10.1016/0045-6535(93)90251-Y. ^ “Greenhouse gas monitoring at the Zeppelin station – Annual report 2004 (TA-2110/2005)” (PDF). Norwegian Institute for Air Research. Archived from the original (PDF) on 30 October 2007. Retrieved 19 January 2006. ^ Forster, P.; et al. (2007). “Changes in Atmospheric Constituents and in Radiative Forcing.” (pdf). Climate Change 2007: The Physical Science Basis. Contribution of Working Group I to the Fourth Assessment Report of the Intergovernmental Panel on Climate Change. Archived (PDF) from the original on 24 July 2010. ^ “Refrigerant 1234YF’s Potential Impact in Automotive Applications” (PDF). Archived (PDF) from the original on 13 July 2013. Retrieved 2013-07-10. ^ Honeywell International (December 2005). “MSDS # GTRN-0047 For Genetron 134aUV”. ^ Alexander D. J; Libretto S. E. (1995). “An overview of the toxicology of HFA-134a (1,1,1,2-tetrafluoroethane)”. Hum. Exp. Toxicol. 14 (9): 715–20. doi:10.1177/096032719501400903. PMID 8579881. ^ G. E. Millward; E. Tschuikow-Roux (1972). “Kinetic analysis of the shock wave decomposition of 1,1,1,2-tetrafluoroethane”. The Journal of Physical Chemistry. 76 (3): 292–298. doi:10.1021/j100647a002. ^ Sellers, William F. S (2017). “Asthma pressurised metered dose inhaler performance: Propellant effect studies in delivery systems”. Allergy, Asthma & Clinical Immunology. 13. doi:10.1186/s13223-017-0202-0. ^ Huchon, G; Hofbauer, P; Cannizzaro, G; Iacono, P; Wald, F (2000). “Comparison of the safety of drug delivery via HFA- and CFC-metered dose inhalers in CAO”. The European Respiratory Journal. 15 (4): 663–9. doi:10.1034/j.1399-3003.2000.15d07.x. PMID 10780756. ^ “1,1,1,2-Tetrafluoroethane”. Occupational Safety & Health Administration. ^ “Norflurane-Pentafluoropropane Aerosol, Spray”. WebMD. ^ Shulman M, Sadove MS (1967). “1,1,1,2-tetrafluoroethane: an inhalational agent of intermediate potency”. Anesthesia and Analgesia. 46 (5): 629–635. doi:10.1213/00000539-196709000-00029. “The Coexisting Curve of the Refrigerant HFC 134a: Some Scaling Models” (PDF). Archived from the original (PDF) on 29 September 2006. Retrieved 11 September 2007.